I arrived at our facility in Campinas, Brazil just before lunchtime. I had spent the previous 20 hours on planes, trains, and automobiles (well, not trains), so when my colleague suggested that we take a short walk outside to the campus cafeteria I readily agreed. Fresh air and at last a taste of that sumptuous Brazilian fare that I love so much sounded like a great idea. As we walked to the cafeteria, I spotted these orchid blossoms on the tips of tall, reed-like stems growing in beds around the campus grounds… Orchids! Growing in the ground, outside! What a beautiful and appropriately tropical welcome to start things off. I love orchids (and used to maintain a small collection back when I had time for such leisurely pursuits), so I asked my colleague if he knew which it was. He didn’t, so I studied it carefully trying to remember its features so I could identify it later. The terrestrial part struck me as a little odd for a Neotropical orchid, and I commented to my colleague that I’d bet it was something introduced from Asia. That is precisely the case, although it took me a while to figure it out. 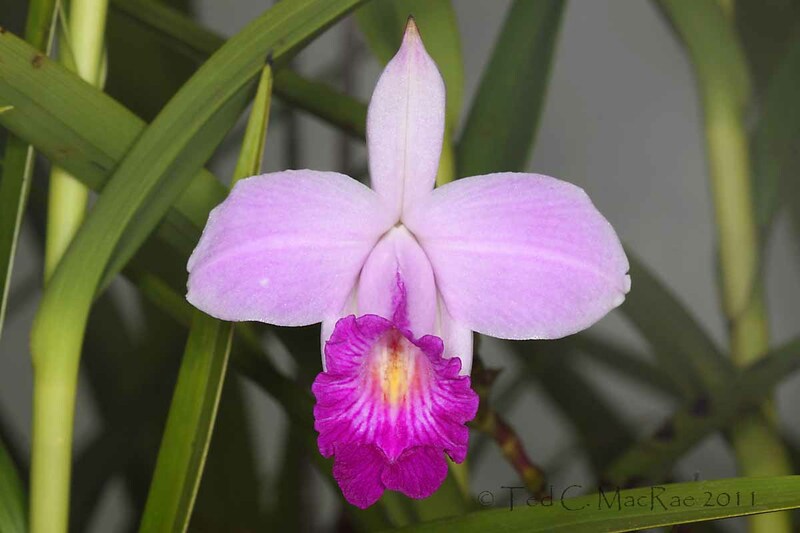 My initial Google and Flickr searches using terms such as “Brazil orchid” and the like produced pages and pages of Brazil’s famous diversity of native epiphytic species, but no obvious matches to this terrestrial species. It later dawned on me that I should conduct my searches in Portuguese, and within the first page or two I found it – the appropriately named bamboo orchid (“orquidea bambusa”), Arundina graminifolia. I would later see this orchid blooming not only in tended gardens, but from cracks in the pavement between buildings. Originating from south and southeast Asia, this sole member of the genus is popularly cultivated in gardens across the tropics and has become naturalized in many areas. Mary Farmer at A Neotropical Savanna has an excellent post on recognition and occurrence of this species in Panama, including detailed discussion and photographs of vegetational and floral morphology and its potential (or lack thereof) for becoming an invasive weed. 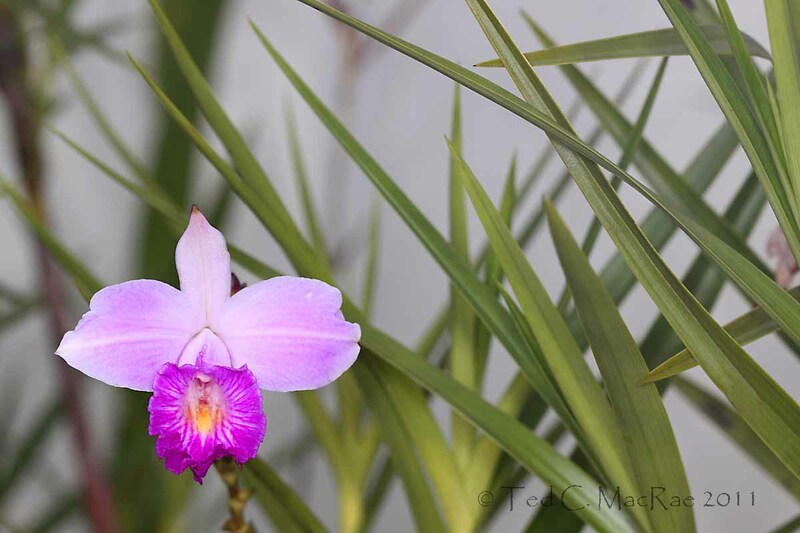 This entry was posted in Orchidaceae, Plantae and tagged Botany, Brazil, Friday flower, nature, orchids, science. Bookmark the permalink. It is a gorgeous orchid no matter what its origin. Yes, indeed – I never got tired of seeing them. Orchid are so beautiful, a jewel of the plant world. At one point I had nearly 100 orchids – I kept them on benches under artificial light during the winter and shade cloth during the summer. It was a job tending to them, but the blooms were spectacular reward for the effort! It’s not hard, just takes time and a special setup. Good luck! It is very common here in Malaysia, they can also grow in disturbed grounds and in the wayside!! Very beautiful. It must be nice to have weeds this beautiful! Thanks for the visit. Well, thank you. Your kind comments are much appreciated.